In the mid-1670s, [Samuel] Pepys and other members of the administration became increasingly alarmed at the navy’s numerical inferiority to the French and Dutch. 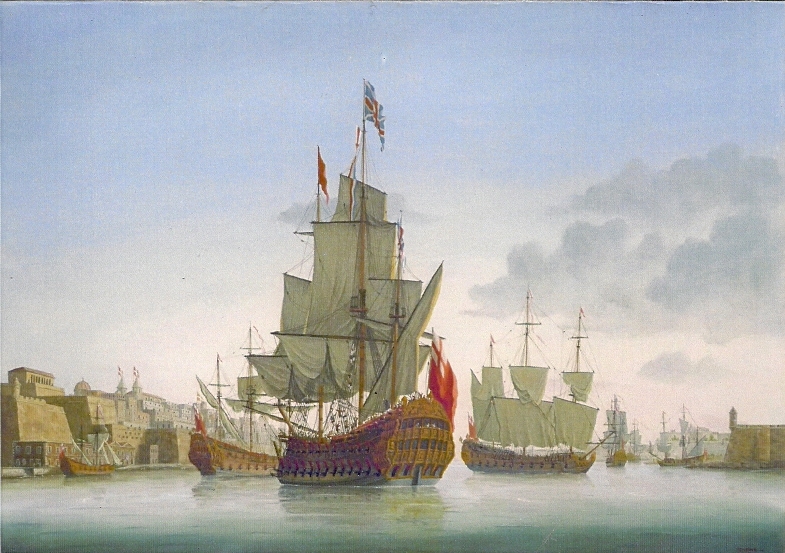 In 1665, Charles II’s fleet had contained 102 major ships, compared to 81 Dutch and 36 French; ten years later, the picture had changed alarmingly…[Figures that Pepys presented to Parliament in April 1675 demonstrated that Britain now had 77 ships of 40 guns and upwards, compared with 85 French and 108 Dutch. ]…At least twenty new ships of the first to third rates were required, and the number soon rose to thirty. At first, it proved impossible to convince Parliament of the extent of the problem and of the need to vote huge sums of money for the building programme necessary to remedy it. MPs were deeply suspicious of what they saw as a crypto-Catholic, Francophile court, and Pepys was shouted down in the parliamentary sessions of 1675. One backbencher protested that ‘ships must have been built of gold at these rates’, and like many critics of defence spending in later years, he grumbled that much of the naval budget was actually being spent on the salaries of bureaucrats. Another warned that they should ‘not provide here such a number of ships, as not to come here again’. However, the year 1676, when Parliament did not sit, saw a series of stunning French naval successes in the Mediterranean, which proved conclusively that Louis’ fleet was not the paper tiger that some MPs had complacently assumed it to be. When Parliament reconvened in February 1677, the mood was decisively different. ‘The king of France’s great fleet is not built to take Vienna’, one MP observed presciently, and on 5 March Parliament voted £600,000 to build one first rate of 1,400 tons, nine second rates of 1,100, and twenty thirds of 900. That was how, in Pepys’s Navy, I described the genesis of the ‘thirty new ships’ building programme of the 1670s and 1680s. The ships that emerged were iconic in many ways. They included the first British warships to bear the names Britannia and Neptune. Some of them survived for many years: making allowance for the nature of the eighteenth century practice of ‘rebuilding’ ships, which often produced essentially new ships, the Neptune of 1683 was nominally the same ship as the Torbay that fought in Admiral Rodney’s fleet at the battle of the Saintes ninety-nine years later. Several of the ‘thirty ships’ were wrecked in dramatic circumstances, and their wrecks provide some of the most exciting and important dives around the British coast: the Coronation, wrecked off Plymouth in 1691, is the subject of ongoing study, while the Stirling Castle, Restoration and Northumberland, lost on the Goodwin Sands during the Great Storm of 1703, have produced a large number of fascinating artefacts that have enhanced our understanding of the seventeenth century navy. 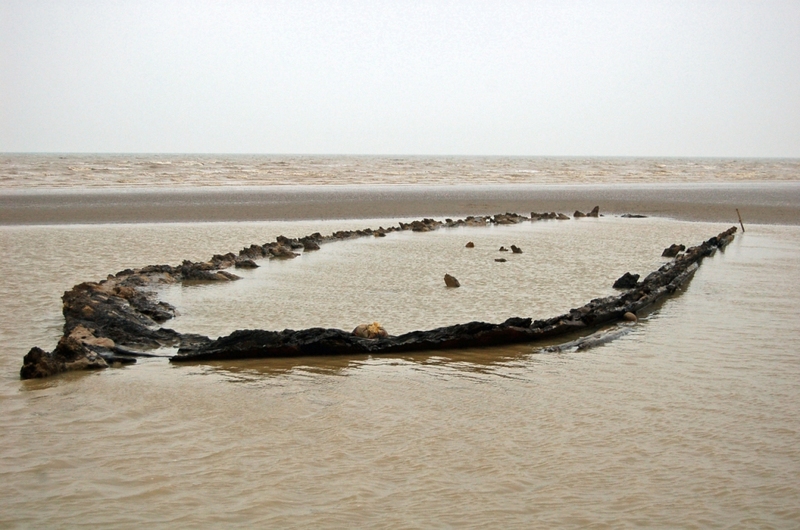 This year the warship Anne near Pett Level is exposed to a greater extent than has ever been known in living memory. All the sand is removed from the beach leaving the remains some 70cm above clay ground level. At the time of sighting the tide was not particularly deep and the gully in which she lies did not have time to drain properly so that only about half the ship above ground level was visible…The Anne is very exposed and vulnerable and we can only expect her rapid deterioration. It is therefore essential on this once in a lifetime opportunity that the remains be accurately recorded as soon as possible before their destruction. The whole of the bottom of the Anne survives undamaged and because she is in her original, as built condition, probably represents the only [British] seventeenth century warship that can be recorded to demonstrate how they were built. 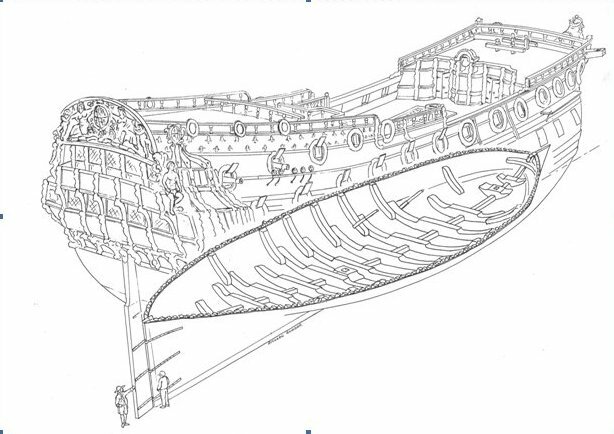 Richard’s reconstruction drawing indicates the extent of the surviving remains in relation to the original appearance of the ship. A team based at the Shipwreck Museum, Hastings, and led by Jacqui Stanford and Kimberley Monk, is working to record the wreck as thoroughly as possible; updates on progress will be posted in this blog and in my Twitter feed, and I hope to get down to Pett Level myself some time during the next few months to see the Anne for myself. However, a word of caution to anyone thinking of doing the same – the Anne is protected by law, and whilst visitors may view the ship, they may not touch or remove anything from it. Next week I’ll be blogging about the exciting project to build a full-sized replica of the first of the ‘thirty ships’, the Lenox. That post, like this one, will have significant input from Richard Endsor – I’m very grateful to Richard for allowing me to quote him at length and to reproduce several of his stunning illustrations.